BERLIN - The Berlin girls basketball team continues to roll as the regular season starts to wind down. The Redcoats beat Farmington 53-44 Tuesday evening to pick up their sixth consecutive win. 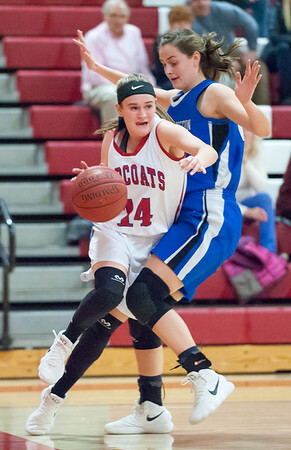 Lyzi Litwinko led the Redcoats with 16 points while teammate Ashley Wenzel had 12. Berlin was able to get a five-point lead by the end of the first quarter, and increased to seven by the halftime break as the Redcoats held the Indians to 14 points over the course of the first half. Berlin is now 11-7 on the season. Southington 47, Suffield 30: The Blue Knights took an early lead and didn’t look back. Janette Wadolowski had a game-high of 23 points, while teammates Kirsten Longley and Kelly Marshall both added seven. Two of the Blue Knights’ starters were out Tuesday evening due to injuries and sickness. Longley and Olivia Pizzitola both stepped up and contributed high-quality minutes, Southington head coach Mike Forgione said. Southington is now 13-5 on the season. Rocky Hill 45, Newington 35: The Indians struggled when it mattered most - in the fourth quarter. Trailing just two heading into the final frame, Newington couldn’t make up the deficit against Rocky Hill. Ashanti Frazier scored a team-high 12 points for the Indians with teammate Maya Gajowiak adding 11 points of her own. Lizzy DiNardo scored a team-high 12 points for the Terriers. Newington is now 8-10 on the season. Prince Tech 60, Goodwin Tech 32: The Gladiators fell behind early and were never able to recover. Paola Barbosa led Goodwin Tech with 12 points, while Tanija Russell scored 11, leaving the Gladiators still in search of that elusive eighth win to qualify for the postseason. What hurt the Gladiators the most was their inability to stop Nya Jenkins, who finished the night with 28 points, including five 3s. Goodwin Tech is now 7-10 on the season. Innovation 68, Achievement First 36: The Ravens continue to improve their postseason standing. Lenny Okonya finished with 15 points, 10 rebound and 6 blocks; Lester Emmanuel scored 19 points and Remiesh Bogle had 10 to lead Innovation to its 11th win of the season. The Ravens jumped out to an early first-quarter lead and never looked back, holding the Royals to single digits in every quarter except for the second when they scored 11. Posted in New Britain Herald, Berlin, Goodwin Tech, Innovation, Newington, Southington on Tuesday, 6 February 2018 22:43. Updated: Tuesday, 6 February 2018 22:50.